Cora and Louise returned to school today. This, in practice, marks the end of our summer. Cora seems quite excited to be back at school. Louise, as you can tell, doesn't seem as excited. Cora is entering 1st grade, and Louise is entering the 3 year old class at day care. A good piece by Amy Phillips republished from her blog by NBC. Given the ages she discusses, it struck a nerve with me. Katie. Yes, you, Katie Brown from Swindon. I nominate you to do the ice bucket challenge within 24 hours, or make a donation to the MND Association. Every time I log in to write a post, my screen shows me a snapshot of my site's statistics. I couldn't help but notice two things: 1. My blog is suddenly getting about 1000 visits every day, and 2. The percentage of visitors that are viewing my blog for the first time has increased dramatically in the past two weeks. In short, lots of new people are tuning in. 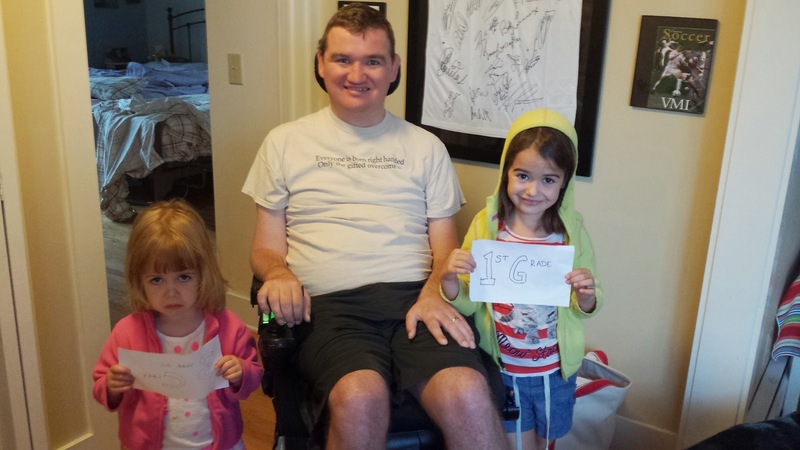 I was diagnosed with ALS/MND/Lou Gehrig's disease in October 2011, but I had been experiencing symptoms from the beginning of that year. I go to one of the best hospitals in the world, Johns Hopkins, for my ALS clinic visits (my check-ups). I've been a guinea pig in two separate drug trials. People have been extremely supportive, and that's allowed me to do some pretty cool things, like driving super-cars (and getting caught doing 125MPH in a 55MPH zone), going to watch Celtic play, skydiving, taking an epic anniversary trip, taking my family to see Mickey, and a family sightseeing trip to DC...to name a few. My college coach created a football tournament to benefit my family. My symptoms were minor in 2011, and I remained active for a while. These days, this is a much more accurate assessment of my physical abilities. As of a few months ago, my breathing capacity was less than 50% of what it should be for a guy my age. In February of this year, my friends at Johns Hopkins to my that, conservatively, I had 12-18 months to live. Right now, I suppose that puts me in the 6-12 month range. The ice bucket challenge has simply been rejuvenating for me. To have a terminal illness is one thing, but it weighs you down when it gets such little publicity, and such meager financial support for research. To some, the ice bucket challenge is a silly fad; "just donate and stop showing off," is a refrain I've caught wind of. The thing is, the ice bucket challenge is the vehicle through which awareness is spread. And people need to be aware before you can seriously, passionately ask them to donate. Don't believe me? During the course of the same three week period last year, the ALS Association raised $1.9 million. This year, during the same period; $22.4 million. I spent some time reading Jonathan Eig's book, Luckiest Man ( ISBN: 9781439126448), this week. 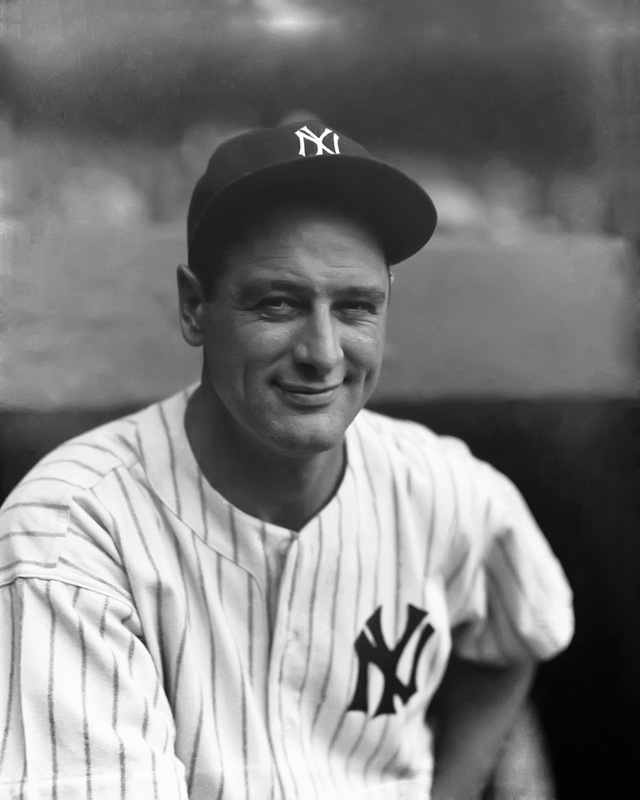 The book chronicles the life and death of Lou Gehrig. Lou's name, of course, is synonymous with ALS and MND. I came across a really interesting passage that I thought I'd share. Lou pushed the records in just about every offensive category, but it was his strength, stamina, and one particular statistic that earned him the nickname "Iron Horse" (then the nickname given to a railway locomotive). Lou played in 2130 consecutive baseball games, before succumbing to ALS, aged 37. The passage I wanted to mention is in connection with a moment when that streak of consecutive games was in danger of being broken. Between regular, professional games, the Yankee management decided to play an exhibition game against a minor league team. Lou was hit with a fastball above the right eye, dropped to the ground, and lay unconscious for five minutes. He was eventually helped from the field and taken for x-rays. The x-rays came back negative, but Lou still had a sizable swelling from the hit. Newspaper reporters were adamant that Lou couldn't recover in time for his next professional game, the next day. But he did, and it's a passage about returning to the batters box after taking a knock-out pitch that stood out to me. If a pitcher sensed that a hitter was nervous about being struck in the head, he would throw inside, exploiting that fear. Once a batter starts leaning away from inside pitches, he has almost no chance of hitting balls thrown on the outside portion of the plate. Gehrig knew it. So he dug his feet in the dirt of the batter’s box, stared out at the mound and took a couple of practice swings. When the pitch came, he didn't shrink. Of course, when you have a blog titled "Don't Shrink," it's hard not to feel your heart flutter when the same phrase is used to describe a key moment in Lou's return to the game. Maybe the name for my blog isn't out of place after all. Incidentally, Lou hit three triples in that game, although they don't appear in the record books; a storm swept through and the game was canceled, nullifying his efforts. You don't seem to be able to look anywhere on social media these days without witnessing someone pouring a bucket of ice-cold water on themselves. It's part of brilliant, simple campaign by Pete Frates ("Freight-eez") to raise awareness of ALS and raise funding for ALS research. 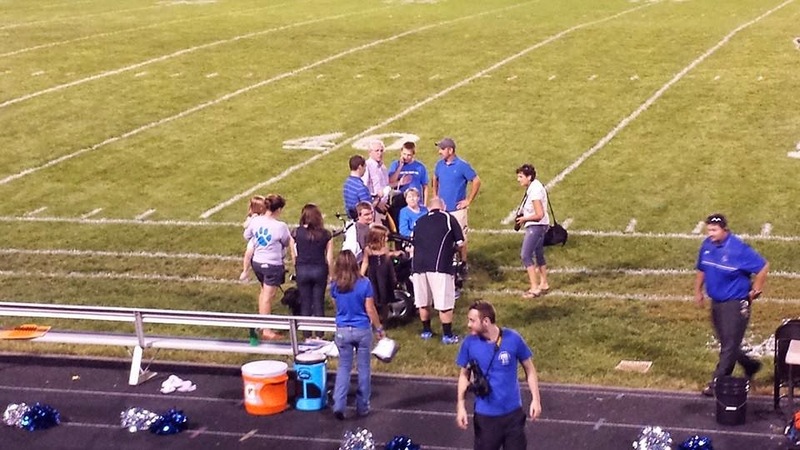 Its been a huge success, with ALS and the campaign making national headlines. I've long maintained that ALS awareness must increase before you can start trying to raise funds for research. Pete's campaign has proven me wrong - slightly. Donations to ALS charities have shot through roof during the campaign. 2. Jimmy Fallon, guests, and his house band, The Roots: a national audience! 1. There are many videos that share first place. They're the dozens of videos out there featuring my family and friends; I feel the love.